The RSQ Audio is designed for home, commercial, and portable entertainment applications, such as hosting a karaoke party at a bar, in a home, or on the road. 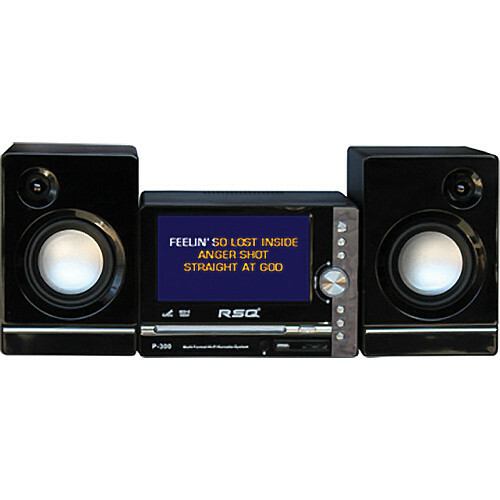 The device features two 1/4" microphone inputs with independent level controls, a CD optical drive, USB input, SD card input, a stereo pair of speakers, a full function remote control, and an integrated LCD for displaying the song lyrics in time with the music. The player is compatible with NEO+G, MP3+G, CD+G, Audio CD, AVI, VCD, and JPEG formats from the integrated USB and SD card inputs. It can also record singing to the USB or SD card from NEO+G, MP3+G, and CD+G formats with lyrics. Song lists can be created using NEO+G, MP3+G, and AVI formats which can then be selected using the front panel digital key control or with the full function remote control. The player also enables 8x ripping for MP3+G and NEO+G formats as well as 4x ripping of CD+G formats to and from the USB and SD inputs. For outputs the player features composite, S-Video, optical TOSLINK, stereo RCA amplifier, and component connectors. Box Dimensions (LxWxH) 22.0 x 14.0 x 12.0"